Ehrmahgerd, it's my first link-up! To bring in 2013, the year of opportunities (I just made that up), I'm co-hosting a blogger book exchange. For me, books are such a personal part of who I am. Reading as child took me to whole new places and inspired my imagination. It contributed to who I am as a crafter, designer, blogger and who I am as a person. So I am really excited about this opportunity and I'm also looking forward to meeting new bloggers. What is a book swap? It's an opportunity to get to know other bloggers and avid readers that are part of the blogging community. By swapping books, you're connecting with another blogger out there in the blogosphere and we're all making the interwebs a "smaller world." When is it going on? The month of January- sign up now until January 12th. Get to know your partner by the 19th and then ship their awesome new read by the 26th. Sound good? your blogging book buddy information (sorry, I love alliterations) and then you're set to go! If you have any questions, feel free to e-mail me or any of the awesome co-hosts! I'm so excited for this! I'm a new follower. I found out about all of this through the Literary Junkies Book Club. I just joined the other day. So excited to have you as part of the team and I'm looking forward to their fresh start reading plan. I didn't do so well following along last time but I'm hoping that keeping a journal with this plan will remind me to check it everyday. Just signed up, found you through the literary junkies book club! Looking forward to it! Ooh once we get back from Colorado, I'll have t see if I can sign up! I've been wanting to do a book swap! New follower to your blog!! Love, love, love it! Hey Kimberly! 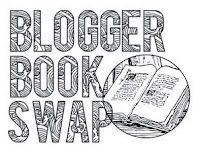 New follower here - I found the Blogger Book Swap via Bobbi´s blog. Would love to participate but I am not sure if this is also for international followers?! I'll have to get back to you on that. I know Bobbi is mailing her items from Amazon so that she can participate. Is that an option for you as well? Yep - Amazon Germany works well! So I´ll do that! Signed up already! My post is up and I'm all signed up! I am super excited for this swap. I love reading and meeting other people who like it too! Yay! I'm also a new follower. I just posted my Reading Resolutions for 2013 and would love for you to check it out! What an awesome idea! I just signed up. Filled out the form from my phone so hopefully it went through! Just checked and you're all set to go! Definitely check your e-mail throughout the week for updates and thanks for signing up! I'm very excited for this book swap! I just found you through the Literary Junkies group. I just joined that group not too long ago also. Always looking for ways to connect with other bloggers and I love to read! So excited! 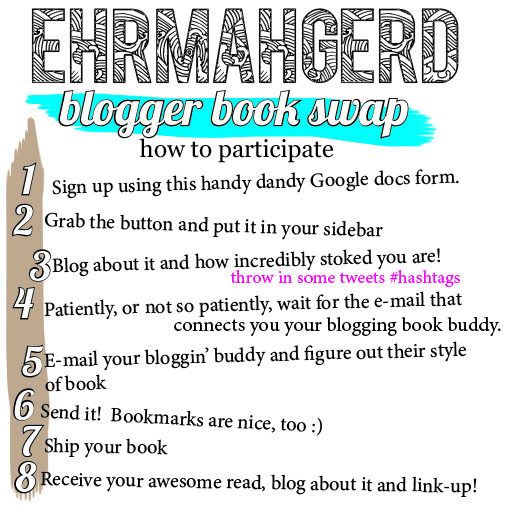 I love books and a Book swap sounds fun! I'm very excited about this! I love to read and one of my goals for 2013 is to make my blog more about me. So, since I love reading I'm trying to incorporate that into my blogging. I love getting and sharing book recommendations so this is perfect. New follower! Blogging goals are always a great thing. I'm constantly adjusting my blog design to make sure it's easy to read and isn't too busy. 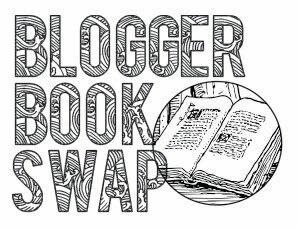 I naturally started talking about books on here and my love for reading and before you know it, the blogger book swap was born. Thanks for the follow! New Follower!! what a great idea!! EXcited to participate!! Just tweeted about the book swap! You´re twitter button is leading to another Kimberly Erskine, so that you know! Hi! I joined the blogger book swap through Today, I'm Bobbi! It's a great idea, and I can't wait to get to know more bloggers while doing the best thing, reading, duh! :) Thank you for hosting, and I'm looking forward to reading more of your blog! Love Bobbi! I am obsessed with her blog and I'm so excited she's one of our co-hosts. Bloggers who love to read, in my opinion, usually have great blog content. It's a win-win for everyone :P Thanks for joining! I'm so excited about this! Thanks for setting it up! Thank YOU for signing up! It wouldn't possible without all of these awesome bloggers (and readers) who have a love for books. I'm really not sure how I found you, I was blog surfing. haha. Anyhow, glad I did because this sounds like so much fun. I would love to participate. I'm also overseas but have both a German and an APO address. If its a problem, just ignore my submission. If there are other APO addresses, I could always be paired with them (free military shipping) or another international blogger with an international address (other than APO). Thanks Lacey! I'll see what I can do, I know there are a few people with international addresses so we'll try to make sure it's a great match. I think I hit the submit button twice, sorry! I am JUST seeing this (on the last day to register of course...lol) and am unable to locate the google doc! I was led to your post by Rae from @ est1987.net and would absolutely LOVE to be part of this! Oh my it sounds like an interesting idea to a fellow book lover like myself. Looks like I'm a day too late though. I am very new to the blog world. I would really like to do this. Where is the google docs to sign up? actually i didn't understand how can i join? just be becoming a follower? This is so cool! I wish I had books in English (I'm from Argentina). Maybe someday I'll join! I didn't know where to link up! but here is my recap! would love to know more too!! please let me know if you do another one...would love to participate! No More "See You Laters"